Meet the heroes behind the superheroes. NBC has released a new preview for their upcoming TV series Powerless. Set in the DC universe, the sitcom follows the ordinary, non-superhero people who must deal with the messes caused by the super-powered. The cast includes Vanessa Hudgens, Danny Pudi, Alan Tudyk, Christina Kirk, and Atlin Mitchell. 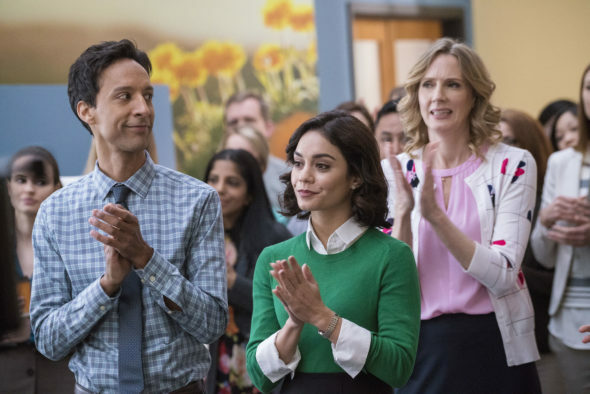 Powerless debuts on NBC on February 2nd at 8:30 p.m. ET/PT. What do you think? Are you a DC fan? Will you watch Powerless? More about: NBC TV shows: canceled or renewed?, Powerless, Powerless: canceled or renewed?